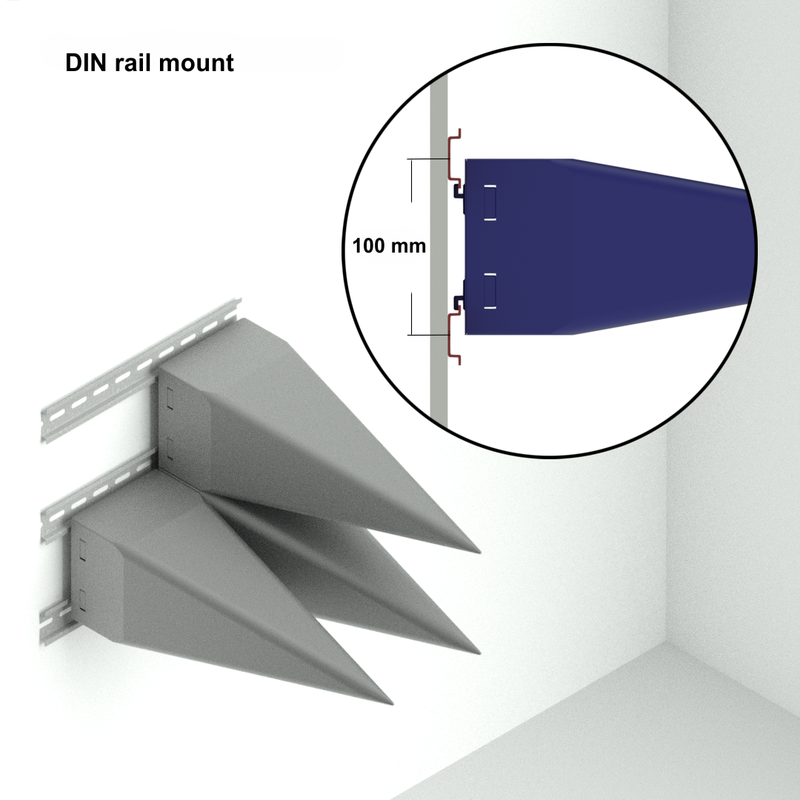 Universal-Delta pyramid-shaped electromagnetic wave absorbers are used for lining anechoic chambers for testing radio wave emitting equipment and antennae of various use, as well as shielded rooms for radio compatibility testing. Additional uses include personnel protection against electromagnetic radiation. 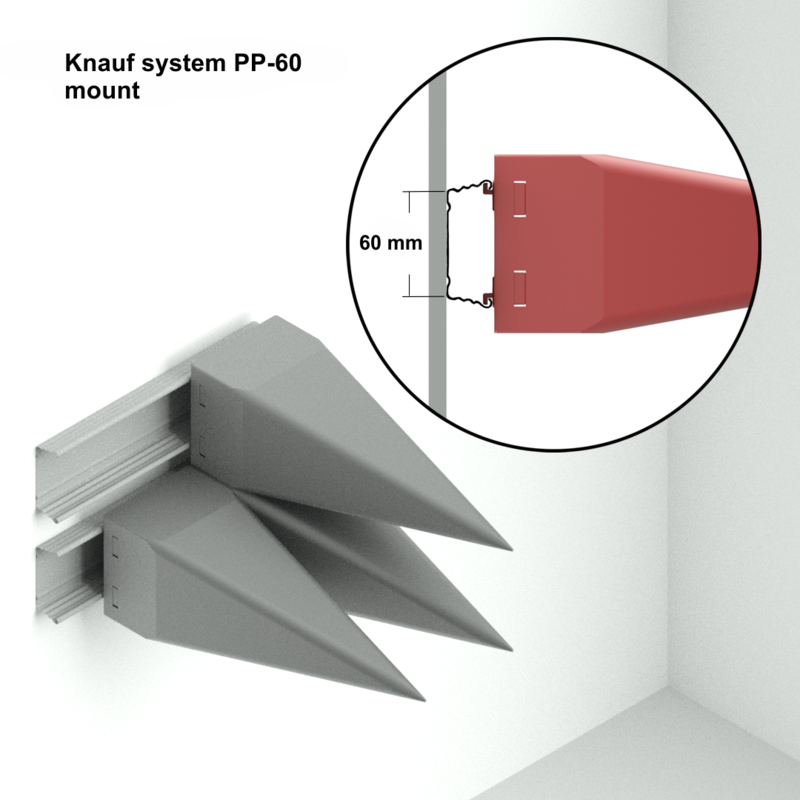 Universal-Delta patented absorbers are pyramid-shaped flame-resistant polymer material containers filled with non-combustible electromagnetic absorbent mixes of two kinds: carbon fiber-based dry mix or foam glass granules with internal absorption, either of which ensures stable performance and operation. Production of Universal-Delta absorbers has a three stage quality control: initial assessment of raw materials, continuous measurement of characteristics of absorbent mix, and final measurements of completed units under standard, to ensure high electromagnetic absorption performance. Universal-Delta absorbers are classified as fire resistant (Certificate 9023736000) and environmentally safe absorbent materials (Certificate 55178729-12-1). 165 x 165 x 580 mm (Type B, BM). To expand the product range, reduce weight and facilitate mounting, Universal-Delta RF absorber can be supplied as Type D block, consisting of nine 65x65x200 mm units, with overall dimensions of 200x200x200 mm. The picture shows Universal-Delta RF absorbers of the following dimensions of 100х100х320 mm, 165х165х580 mm and 200х200х200 mm. Polyamide (PA) V-0, UL94 (working temperature range -50ºC to +250ºC). 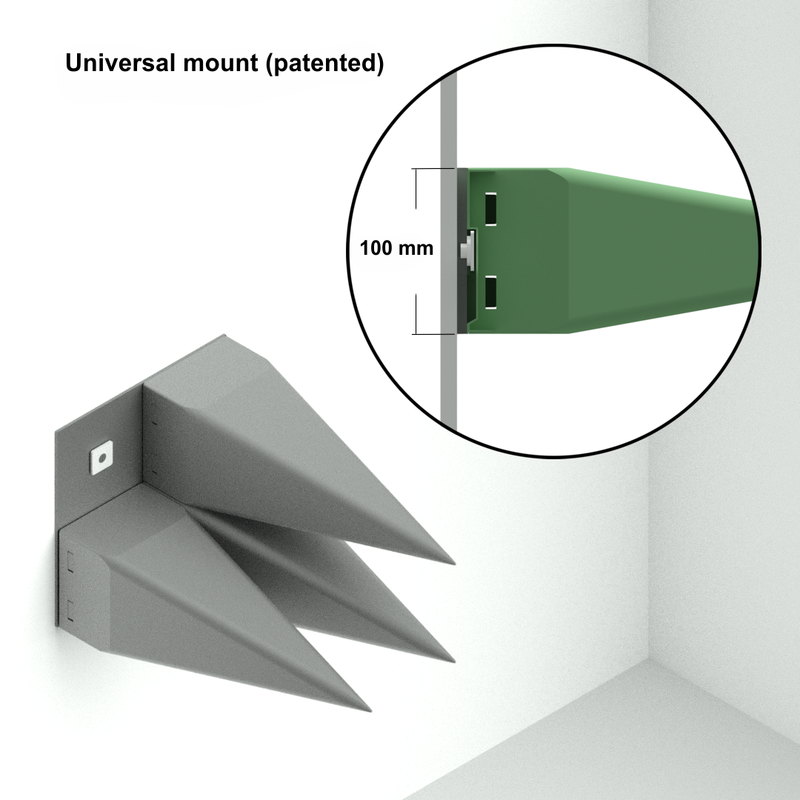 universal mount (patented) – this can be used for combined RF absorber units with ferrite tiles. Container covers have product ID markings. PGV – foam glass granules with internal absorption (working temperature range -50ºC to +500ºC). Foam glass granules (PGV) – due to their sealed cell structure – and dry mix (EVU) sustain extreme heating without deterioration in their RF absorbent qualities. PGV granules are a loose RF absorbent filler. Types AM, BM are filled with RF absorbent layers with varying carbon fiber content. Types CF, DF have 100x100x6 mm ferrite tiles, with attachment. Type A, AM, B, BM, D, DF, CF containers are made of polystyrene V-0, UL94 of light grey color. Type A1, D1 containers are made of polyamide V-0, UL94 of black color. Service life of all units is over 25 years. Notes: Type AF and DF with ferrite tiles size 100 х 100 х 6,0 мм. sample measurement of reflectivity coefficient of each product batch against requirements of standard in the 0.4-15 GHz range. This standard requires measurement of power reflectivity coefficient in free space by interference method, with normal incidence of EM wave. EM field reflected off the product sample forms a standing wave in the transmitting/receiving antenna. The wave's amplitude is measured by the sensor when the sample is moved against the antenna and the signal phase is changed. It should be noted that the method demanded by this standard delivers high sensitivity and precision of measurement throughout the quoted frequency range – thus guaranteeing reliable accuracy of performance parameters of our units.